Heather -- Christmas breakfast is eaten around the tree as the children open their presents. 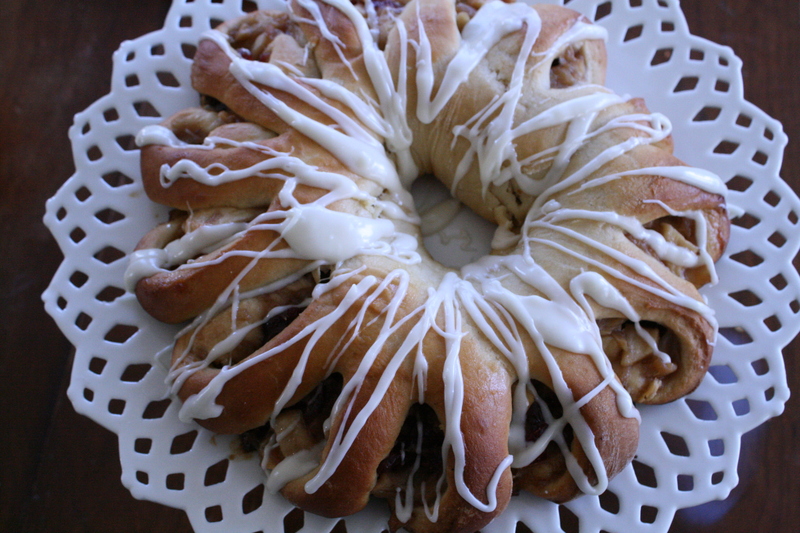 The first year we were married I discovered the recipe for Swedish Tea Rings and have made one for Christmas breakfast ever since. The rest of the menu may vary some, but it always includes fruit. In recent years we've enjoyed bacon-wrapped sausages sprinkled with brown sugar and then baked and I often buy some thick, Greek yogurt to serve alongside the fruit. Drinks consist of juice and plenty of hot tea. 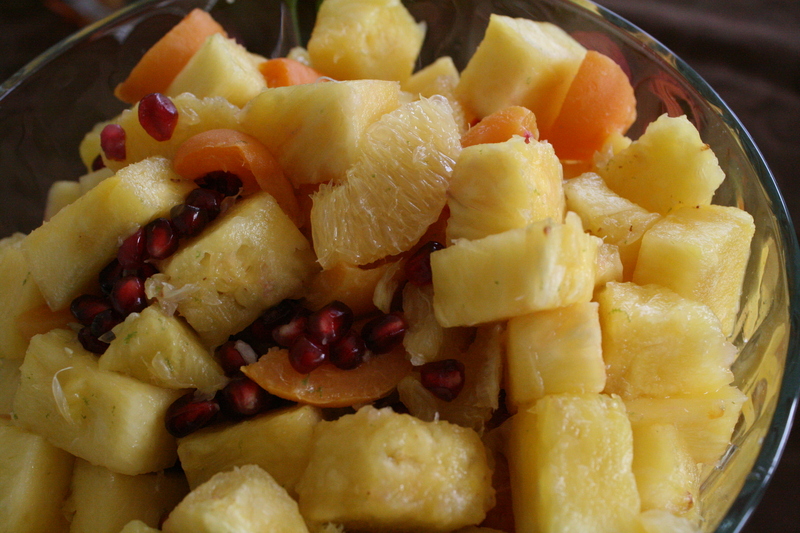 Cut pineapple into pieces and place in a serving bowl. Add the mandarin or navel oranges and the can of apricots. Sprinkle over the zest of lime and stir in the lime juice. Best made the same day as eaten. For variety I sometimes add dried cranberries or pomegranate seeds. For those who like ginger, one teaspoon of freshly grated ginger adds a wonderful zing or try a few tablespoons of finely sliced candied ginger. Mix 1 ¼ c. flour, sugar, salt, and yeast in a bowl. 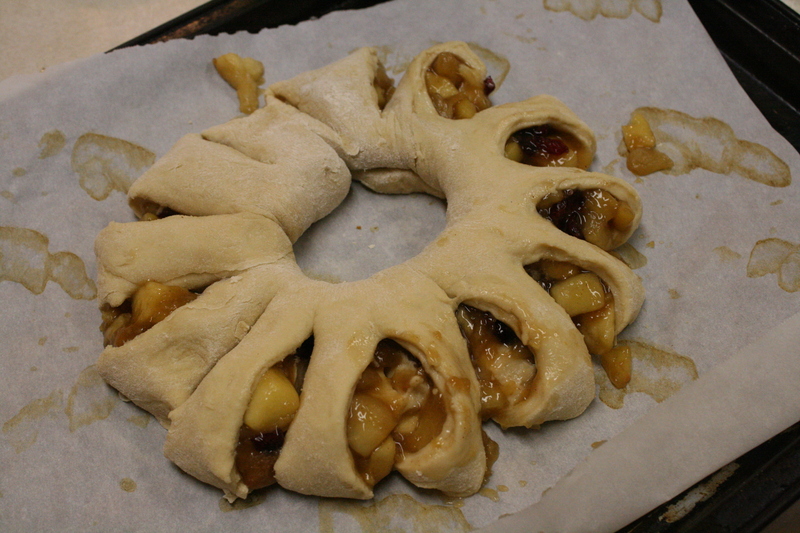 Combine nuts, ½ c. flour, and brown sugar. Turn dough onto a lightly floured board and divide in half. 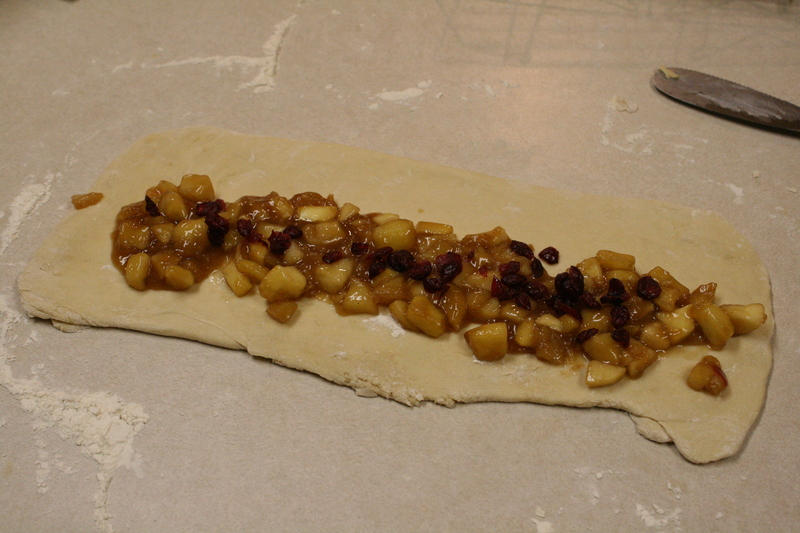 Roll ½ of the dough into a 14x7-inch rectangle. Spread with ½ of the fruit. Sprinkle with ½ the brown sugar mixture. Roll up from long side as for jelly roll. Seal edges. Place sealed edge down in a circle on a greased cookie sheet. Seal ends firmly. Cut slits 2/3 through ring at 1-inch intervals; turn each section outward, on its side. Repeat with remaining dough. 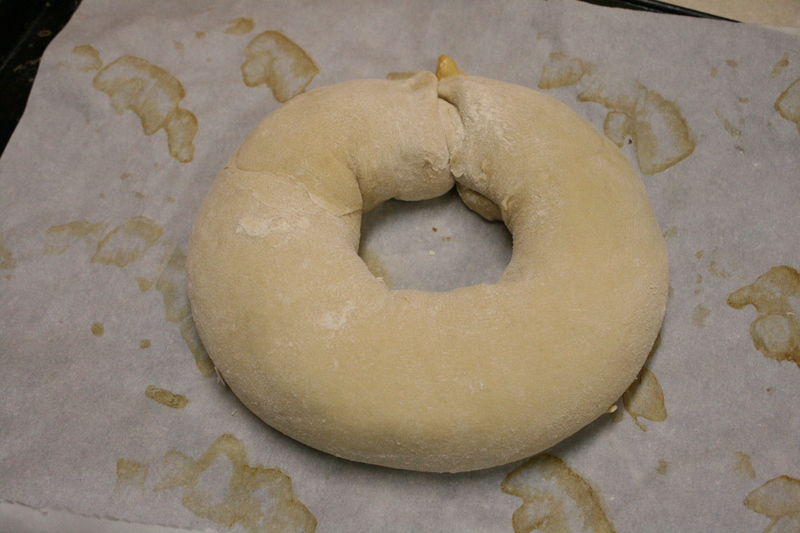 Cover and let rise until doubled – about 1 hour. Bake at 375 for 20-25 minutes or until done. Cool on wire rack. Frost while warm with confectioners’ sugar glaze. Often I don't have the canned filling I want so I make an apple filling by chopping about 3 large, peeled apples and mixing them with 1/4 c. flour, 1/2 c. brown sugar, juice of one lemon and a few dried cranberries. Bring this mixture to a boil and cook until thickened, stirring constantly. Glaze: mix 3 tablespoons soft butter into about 1 1/2 cups confectioners' sugar. Add enough milk to make a drizzling consistency. Add more sugar if needed to thicken. Alaina - We traditionally enjoy an egg casserole, fruit, some kind of bread or coffee cake, and a few special drinks. The coffee pot is kept going for those of us who were awakened early by eager children. 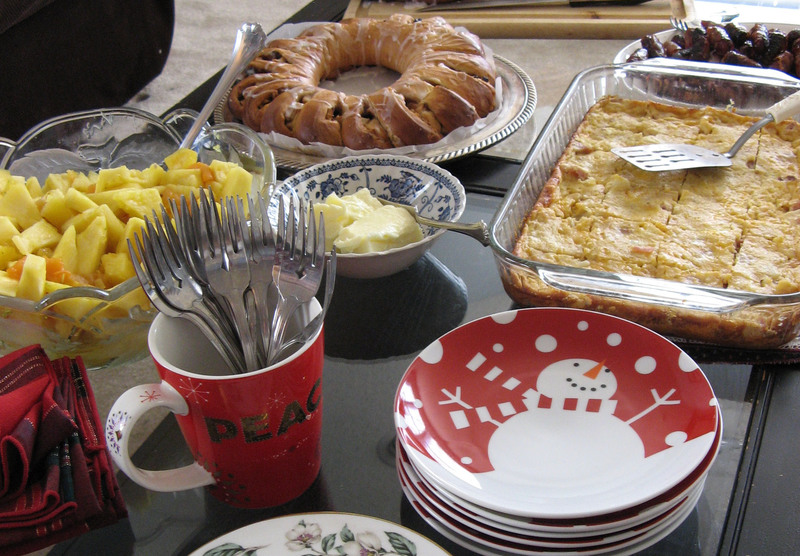 We have breakfast after stockings and gifts are opened or in between the stockings and gifts depending on the time. It's a leisurely affair and one that I find makes me incredibly content and reflective. I use the same base recipe for my egg casserole and just switch out the meats and cheese and sometimes add vegetables to make it different. We love it and I've been making it year-round for years. One of my favorite combinations is bacon, spinach, and swiss and we also love the traditional classic of sausage and sharp cheddar (onions & peppers add great color and flavor). You could easily make this vegetarian by omitting the meat. This egg casserole also re-heats very well if you have leftovers. I'm sharing one of my favorite versions. Combine all ingredients. Pour into a greased 9x13 pan. Bake at 350 degrees for 45 minutes - 1 hour until golden brown. *May not need much salt. **May be made the night before and refrigerated. These muffins are delicious! You could make them even more special by drizzling a little glaze over them. In a large bowl, combine the dry ingredients. In another bowl, beat the eggs, milk, oil. Stir into dry ingredients just until moistened. Fold in zest and cranberries. 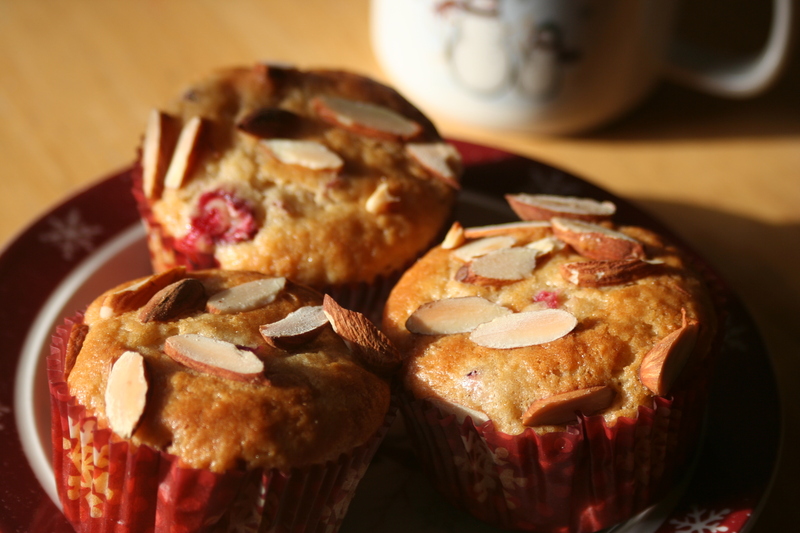 Fill paper-lined muffin cups two-thirds full; sprinkle with almonds. Bake at 400 degrees for 18-20 minutes or until a toothpick comes out clean. Cool for 5 minutes before removing from pan to a wire rack. Makes 1 1/2 - 3 dozen muffins. This icy drink always reminds me of my childhood. My mom used to surprise us with it and now I love to share it with my children. 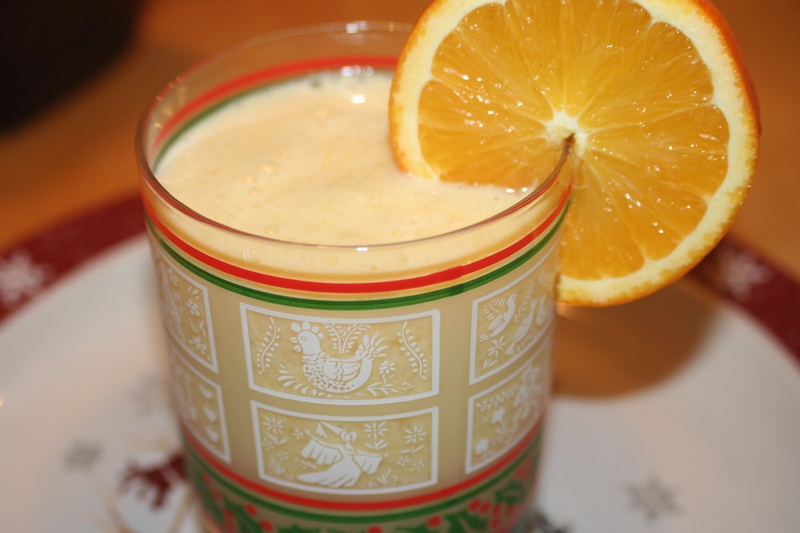 Combine all ingredients in blender or smoothie machine and blend until ingredients are mixed and ice is pulverized. Makes 4 servings. Yum! Everything looks delicious! Breakfast food is absolutely the best. Some of our Christmas breakfast traditions include Stollen, croissants with Nutella and holiday jam, Trader's Point Creamery yogurt with homemade granola, and poached eggs on toast. I think I get just as excited about the food as about the fun of opening gifts. You are ALL (including Amy!) more energetic than I am, but I love looking at the pictures and thinking about making one thing for Xmas morning. I hope yours is a happy one! thank you! thank you! thank you!!! 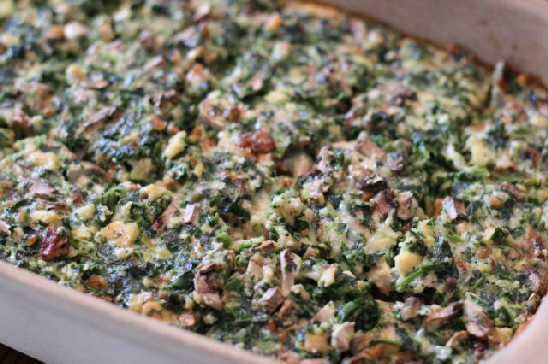 i have been needing a new breakfast casserole recipe for this years gathering and i am so grateful to your blog that you all have posted one!!! yeah for me!!! happy holidays to you both! i LOVE your blog!